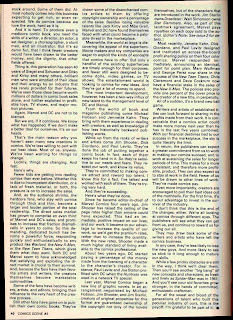 Comics Commentary: Frank Miller's "The Price"
Following last week's reprint of a guest editorial by John Byrne, this time I'm posting an article by Frank Miller, originally published in Comics Scene #3 (May 1982). In this article, Miller reviews the deals made by creators such as Siegel & Shuster or Lee, Kirby, and Ditko; he affirms that neither DC nor Marvel are to blame for not giving these creators a larger compensation for their work ("If Siegel and Schuster [sic] had wanted a bigger piece of the action, they should have swung themselves a better deal"); and then proceeds to enthusiastically describe how treatment for creators has improved in the past few years. 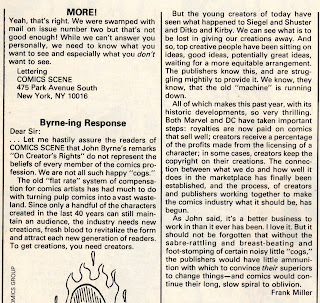 In contrast to Byrne, who argued that creators asking for more benefits would only harm the fans, Miller concludes that these incentives will drive creators to do better work ("For the first time, it's to our advantage to invest in the survival of the industry"). As I mentioned in my previous post on the subject, all these articles were written while Steve Gerber and Marvel were fighting over the ownership of Howard the Duck. In my next post, I'll show Steve Gerber's reaction to this discussion.